Chi is a business growth consultant, digital marketer & direct response copywriter. He helps clients in the healthcare industry grow their businesses and achieve long term success through his digital marketing training, personal development coaching & entrepreneurship mentoring services. 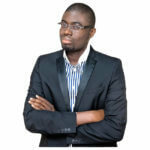 He quit his 9 to 5 job to start an ecommerce company in his hometown in Lagos, Nigeria. The venture failed and had to be closed down but Chi viewed the experience as valuable education in his entrepreneurial journey. He then decided to launch another business to help entrepreneurs and small businesses overcome some of the key issues that lead to business failure. He currently works with several small and medium scale enterprises in Africa, Europe and the Middle East. He’s a frequent contributor to large publications like the Huffington Post, Influencive and more. In addition, he hosts a podcast titled The Bulletproof Entrepreneur where he interviews entrepreneurs, thought leaders and creative artists.